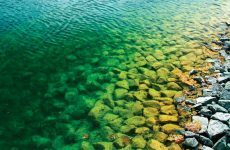 Could the ‘Pay for Success’ Model of Environmental Impact Bonds Be the Future of Water Infrastructure Financing? My wife and I have typically shied away from hobbies that could put me in a position of having to fix things that might break — such as a boat. But as longtime residents of Washington, D.C., we are drawn to spending time near the area’s rivers and recently found ourselves part of a local boat share program. We’re hooked — and not responsible for repairs! Stepping off the dock and into the rented boat with friends and family somehow gives us the feeling that we’ve left it all behind…work, stress, long lists of to-do’s. It’s not how far we go but being on the water that does it. I don’t take this water for granted. It has required significant investment from many parties, including our local utility, DC Water. For the past few years, I have been on a quest to help solve the financing challenges that public utilities, governments, health systems and many others face as they seek to invest in our health, safety and enjoyment. 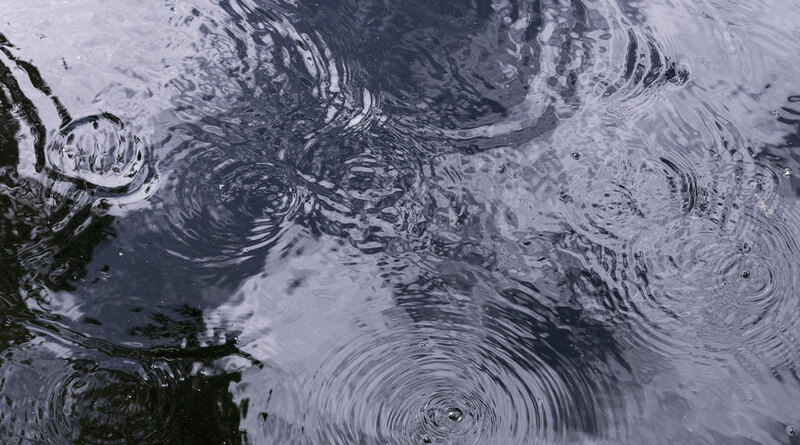 The work across the water sector is mission-driven and shaped by a number of prominent and concurrent trends. First up…climate change, which has already brought increasing episodes of catastrophic weather across the country and around the world. According to the National Climate Assessment, heavy downpours have become heavier and more frequent, mostly in the Northeast, Midwest, and upper Great Plains, where precipitation is than 30 percent above the 1960 average. Large parts of the Midwest and Northeast, where the largest increases in heavy rainfalls have occurred, have experienced major flooding events. The Assessment also predicts increased flooding, even in areas where rainfall has decreased, due to climate change and human factors, such as failing dams and levees and coverage of previously porous land that’s now paved. Second, we are seeing an overall decrease in public sector funding, particularly for projects that would make cities more resilient in the face of increasingly unpredictable and damaging weather events. Infrastructure across the country has fallen into disrepair, and traditional finance approaches for improvements have struggled to keep up. Last June, the American Society of Civil Engineers (ASCE) gave the country’s infrastructure an overall rating of “D+”, estimating an additional $206 billion per year above current projected spending that’s needed to improve our water, waste management, energy, and transport systems and restore their basic function. If that gap isn’t filled, the ASCE predicts that poor infrastructure will cost the country $3.9 trillion in lost GDP, $7 trillion in lost business sales, and 2.5 million lost jobs by 2025. And the last — but certainly not least — trend is the rise of “impact investing.” Private investors have shown themselves willing and eager to put their money to work on solving environmental and social problems. We are experiencing the greatest wealth transfer in history — and the generation on the receiving end is interested in social and environmental outcomes, as well as financial return. The good news is that there is a lot of money from these impact investors waiting to be harnessed for good. 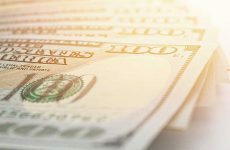 According to the Forum for Sustainable Investment, managed U.S. assets committed to impact investing grew from $640 billion in 1995 to $6.57 trillion in 2014. This new source of capital — impact investing — isn’t going away. Forward-thinking city managers, utility executives, and similar leaders know that now is the time to figure out how to leverage it. The challenge in tapping into these pools of capital is packaging great environmental projects into deals that are attractive to investors. Collectively, these trends set the stage for the Environmental Impact Bond. 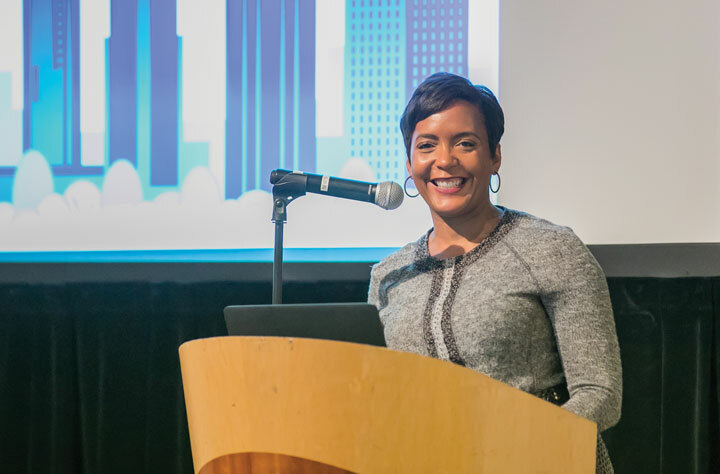 Atlanta Mayor Keisha Lance Bottoms announced at the 17th Annual Parks & Greenspace Conference that the city’s Department of Watershed Management will use EIBs to finance green infrastructure projects to improve the resilience of an area devastated by flooding in recent years. As a result, rather than paying for “process” — investing in a project and hoping the desired outcomes will result — DC Water will pay for actual measured outcomes that have both human health and environmental consequences. The issuance received extensive media attention and interest from a wide variety of players — from the bond market to the impact investment field to major philanthropies — as it demonstrated a scalable, data-driven approach to bringing private capital to environmental projects across the country. In May 2017, the Government Finance Officers Association gave its 2017 Award for Excellence in Capital Financing and Debt Administration in Government Finance to DC Water for its Environmental Impact Bond. DC Water’s Environmental Impact Bond also won Bond Buyer’s 2016 Deal of the Year award for Non-Traditional Financing. Unlike other social impact bonds that have taken the form of performance contracts, the DC Water Environmental Impact Bond was issued as a true municipal bond, engaging traditional investor Goldman Sachs and impact investor Calvert Impact Capital (formerly Calvert Foundation). Soon after the bond’s public launch, Quantified Ventures sought to replicate and scale this approach, working through philanthropic partners such as the Rockefeller and Kresge Foundations, to help catalyze this new market, and directly with municipalities interested in replicating the Environmental Impact Bond approach to bring capital to their resilience investment plans. Last month we announced Environmental Impact Bond collaborations with two major U.S. cities, Atlanta and Baltimore; both will be financing green infrastructure and resilience projects and, we hope, paving the way for many more in the United States and beyond. Think Data: Municipalities are interested not just in sharing risk with private investors, but also in the possibility of quantifying the benefits of projects and engaging other public and private payors who benefit from those projects. For example, Baltimore is interested in using the Environmental Impact Bond to finance green infrastructure projects that they hope will provide job opportunities for local residents. As we study the outcomes and benefits of their project, we can generate data on the number of jobs actually created as well as other specifics on employment impacts. Quantifying these economic benefits could allow Baltimore to bring agencies tasked with job creation in on future Environmental Impact Bonds projects for green infrastructure. 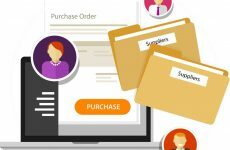 Keep it simple: It’s important to keep it simple and focus on creating replicable transaction financing, which often means working backwards from structures that are “normal” to capital markets. When we describe the DC Water transaction, we focus on the fact that it was a traditional bond with performance payments added on — to emphasize to municipalities and investors that it’s a familiar approach to financing. This also allows us to stay focused on creating replicable, scalable transactions in order to make the Environmental Impact Bond a broadly-useful tool. Always Innovate: We have found efficiencies by financing around proxies for outcomes. For example, stormwater quantity flow in DC sewers serves as a proxy for a cleaner Potomac River, which itself would be very difficult and costly to measure. Flow here is something more easily measured that works toward that higher mission of a cleaner river. While there’s always a desire to measure as accurately and scientifically as possible, we encourage our partners to keep in mind that the due diligence bar is set for the investor — and simpler measurement, translates to cheaper and easier transaction structuring. 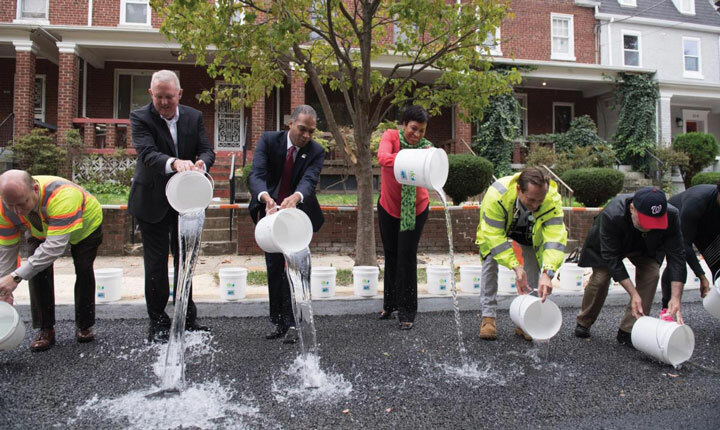 Mayor Muriel Bowser of Washington, D.C. (middle right), joins representatives from DC Water at the groundbreaking ceremony for the green infrastructure projects supported by the Environmental Impact Bond. Because they are new, these types of projects require a strong internal champion to drive the process, which entails stakeholder education and coordination around a shared future vision. Now is the time to get familiar with Pay for Success models and impact investing vehicles — and start building internal support for incorporating them into future plans. It is important to introduce concepts like Environmental Impact Bonds at the right time. Be aware of political and budget cycles, as well as the appetite for both innovation and projects like green infrastructure. As we cross into this new frontier, we must remain determined. Those who will be prepared for the future of finance are looking at the long game — noting forces at work, and using them as opportunities to blaze the trail for others. 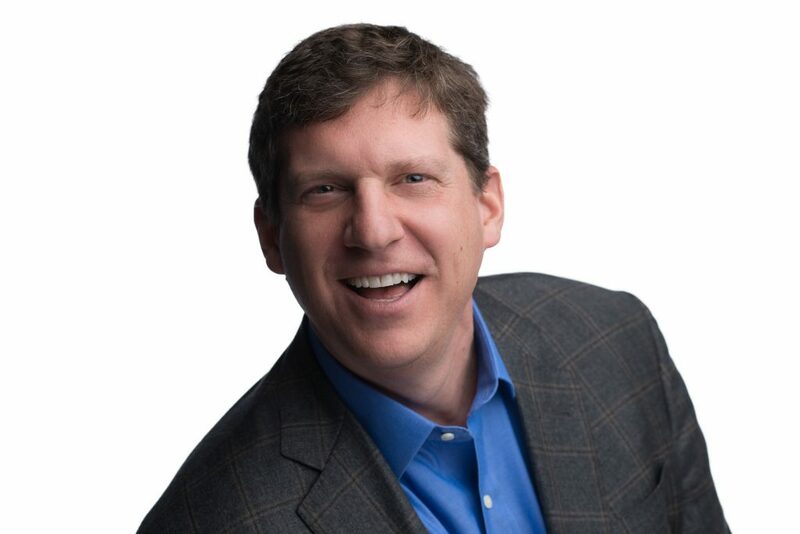 Eric Letsinger is the founder and CEO of Quantified Ventures, a for-profit impact investing firm that helps clients finance specific and measurable environmental, health, and educational outcomes. He is a “tri-sector” executive, bringing 25-plus years of leadership experience in government, nonprofit and private sector organizations.